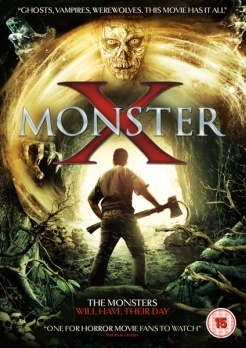 MONSTER X is an anthology movie containing 4 shorts and a wraparound feature that was part of a TV series. This particular episode, taken from the American TV series THE DEAD HOUR (2010-2014) directed by Daniel B. Iske is called FRIGHT FEST. It follows a horror fan on a first date with his new lady at the local cinema theatre to watch a horror movie marathon. This starts off fairly bland and normal but as the other shorts come and go this gets a little weirder every time cramming in werewolves, serial killers and zombies to chase after the hapless couple. The first short movie we see is BANSHEE by Sean Von Leijenhorst. It is the tale of a wife who looses her husband to a curse placed on his family. With the police baffled as to how this happened his wife does some investigation herself and discovers the horrifying truth surrounding this curse and a silver comb that her late husband had found after seeing a mysterious female figure. Movies 2 & 3 are both directed by Patrick Rea. They are HOWL OF A GOOD TIME, where a young girl sneaks into a cinema theatre during a late night movie. The theatre has sold out of food, its a full moon and the cinema goers are hungry for meat. This features a brief appearance from Leslie Easterbrook (Halloween, House Of 1000 Corpses, Police Academy) and is quite a lot of fun. Rea's other offering is NOW THAT YOU'RE DEAD, a revenge story of a wife who's husband leaves her for a vampire. The final movie in this anthology is DON'T LET THE LIGHT IN by Jaysen P. Buterin where a young boys new babysitter gets more than she bargained for when the boy talks of monsters under his bed. So, at just over an hour long we've had witches, vampires, monsters and zombies which all sounds like a hell of a lot of fun doesn't it? And, well, this is right to an extent, it is entertaining but there is a few major down sides to it that I feel need to be addressed. This is obviously a movie made by horror fans for other horror fans to just have fun with but it would've been so much better if the scripts and dialogue were better, if they had tried to do something a bit different with the stories to bring something a bit more unique to the mix and if the actors were less wooden and actually looked like they wanted to do it. Every single movie was just awkward and didn't flow well at all I think that was my major problem with it. Its very low budget so the special effects are mostly practical and basic but not awful at all, they are fun and give the whole thing an 80's horror movie feel. My favorite shorts were both of Rea's offerings, the werewolf one because even though the acting was cringey it was quite fun and his vampire movie because it was a little more unexpected than the others and the most original. Its a big poke at cheesy 80's horror movie humour, a pizza and popcorn movie, something silly to watch as Halloween is approaching but nothing more.